Next month will see a whole lot of nervous parents finding out where their little ones will be attending school in September. I will be one of them. Back in November, the hubby and I along with our daughter began the task of finding the perfect school for our needs. Being a teacher myself I thought this would make the task easier, but actually, I think it became a lot harder! I was clearly over analysing everything. For me I didn't want to be completely focused on what "Mr Ofsted" had to say, I wanted to focus on the feel of the school and how they shaped their students to be well-rounded individuals and not just successful academically. We looked at four different schools and was actually very surprised at how different they were. All of the schools had been rated either good or outstanding, so from that perspective I was happy with all of them. We visited the one that was deemed as outstanding and I have to admit this school was our least favourite. The children were disengaged, looked bored and all the classes had teachers sat at the front talking at them, rather than having engaging activities. I knew instantly that this wouldn't be a place where Darcie could thrive. She needed the opportunity to get "hands-on" with her learning and felt she would easily become bored with this "outstanding" school. The school that we did set our hearts on is one that has such a wonderful community feel. The children were engaged, there were plenty of staff in each classroom to work in smaller groups when needed and the children appeared to be loving learning! Which is something that is key to what we had been looking for. 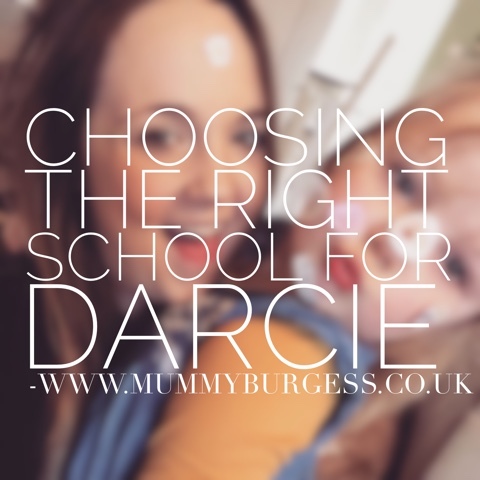 There is so much to consider when choosing a school and it can become a bit of a minefield, but I think you have to go with your gut. At the end of the day, you know your child best, you know their needs and the circumstances they need to flourish and, of course, the hope that you get your first choice. Our chosen school is out of our catchment area but is actually more convenient for us. Everything about it seems like the perfect fit. I'm incredibly nervous about getting our results but at the same time, I'm getting quite excited for this new chapter. I love learning and I hope my daughter does too. So, for now, we wait. Is your little one due to start school in September? Did you find choosing the right school difficult?